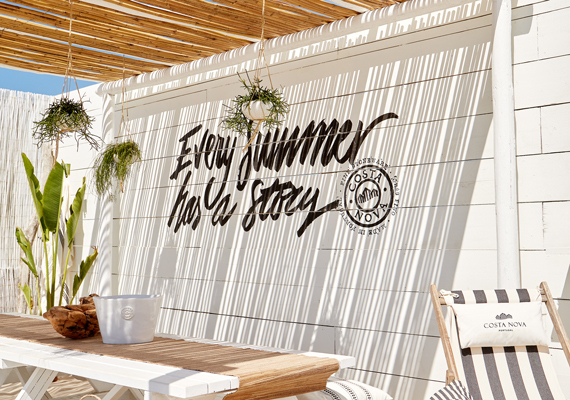 THE GARDEN – LIFE IN FULL BLOOM was the slogan chosen for the campaign, which reminds us of the arrival of Spring and all the sensations it awakens. "There is no better time than Spring. When life lives in everything and everywhere, including our home. We decorate our tables with flowers, put plants in our vases and let nature alive." The campaign matches with the launch of the new collection of decorative pieces LE JARDIN, designed in partnership with the French floral designer Christian Tortu. 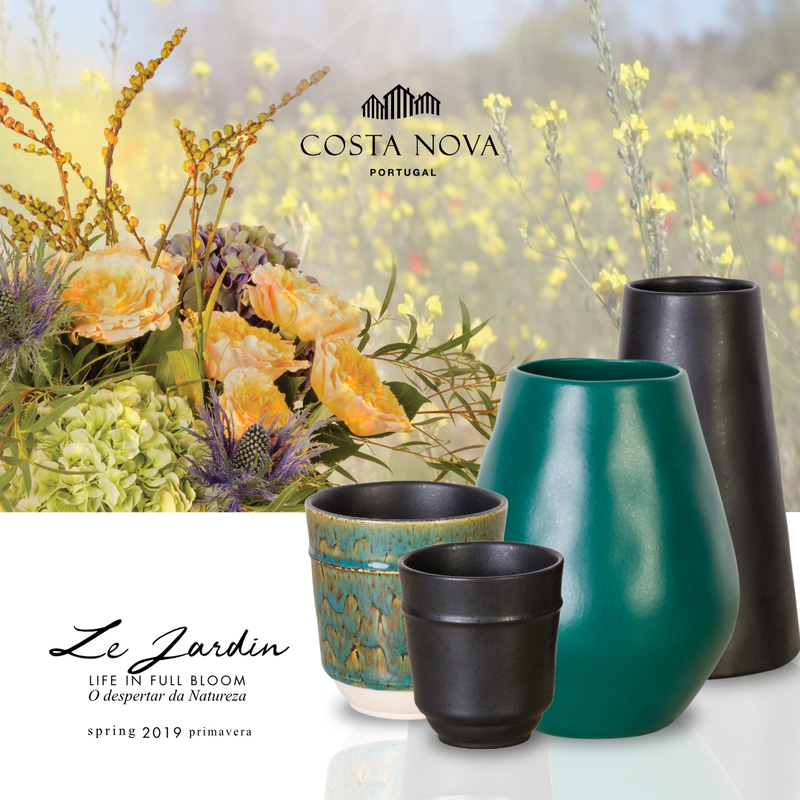 This is the first COSTA NOVA collection composed exclusively of decorative pieces, an eclectic mix of original silhouettes and glazes capable of surprising decorative effects, with or without flowers. All the products are already available online and in stores (Lisboa and Aveiro, Portugal). New year, new inspiring collections to share with you at the major stages in the USA. 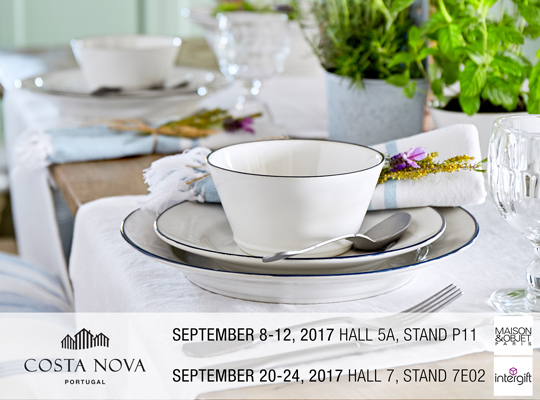 It would be a great pleasure to meet you again and show you at first hand our latest additions in tableware, accessories and home décor. Founded in 2003 by Creative Director Eileen Johnson, FlowerSchool New York is the most prestigious center for the floral arts in New York City. This collaboration is also extended to Flower School Los Angeles. The partnership reflects our love for table floral design and aims to increase the exchange of ideas and expertise. 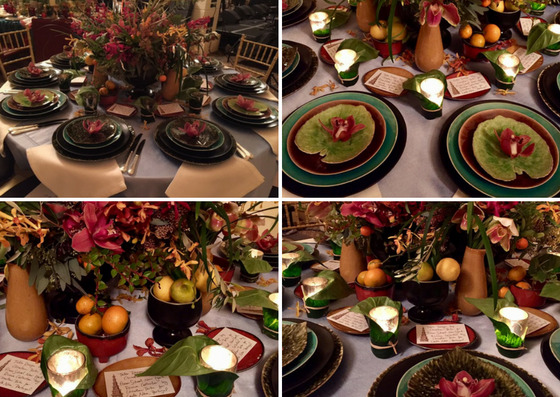 LA and NYC students will now have the opportunity to create beautiful table decorations using a wide selection of COSTA NOVA tableware and decorative pieces. The new season will start with our commitment to surprise you with our latest collections in fine stoneware and high-quality table accessories. 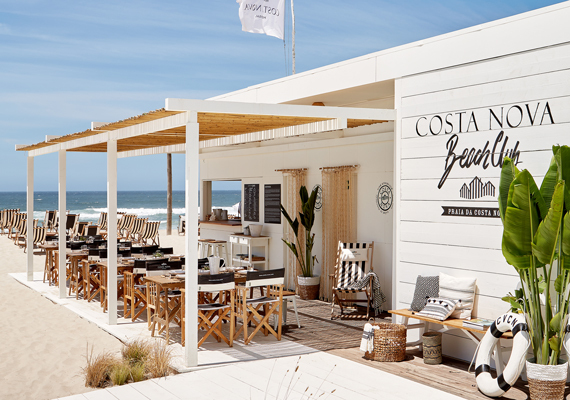 This Summer, the best spot is at Costa Nova beach in Ílhavo, Portugal! Enjoy the beach and the sunny days, gather friends, watch the sunset and make wonderful memories! Shortly after the launch at Maison&Objet Paris, the Riviera collection was featured in the iconic Plaza Hotel in NYC at an exclusive dinner party organizes by NYC Flower School of Design. 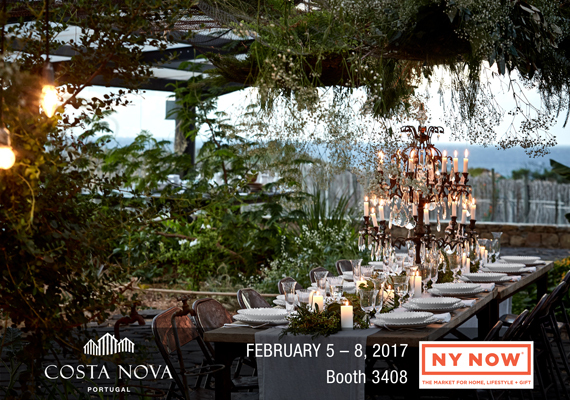 An excellent and prestigious opportunity to present not only the collection, but also our brand COSTA NOVA in the US market. Exciting tableware and accessories collections in high-quality fine stoneware, complemented with matching ranges of flatware, glassware and table linen, will be exhibited for in this trade show for the first time, following the latest trends for the upcoming season. Come visit us this February 5 - 8th 2017 at Javits Center, NYC, booth 3408. 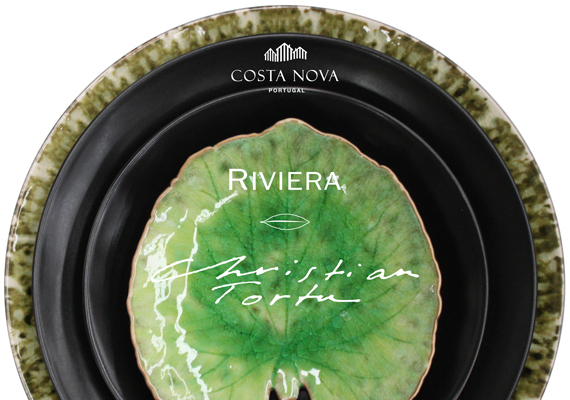 COSTA NOVA, a Portuguese brand recognized for outstanding quality and unique products in fine stoneware, unveils brand-new collection of tableware – RIVIERA – designed by prestigious floral designer Christian Tortu. Exhibited for the very first time this January at Maison & Objet Paris, the new Christian Tortu collection is inspired by the Riviera, the famous French and Italian region. This coastline has always been a haven for artists, attracted by its unmatched light. With their minds on holiday, they have often broached decorative arts all the while relying on unique traditional know-how. Thinking of them has given birth to the Riviera collection, a modest tribute to their tremendous talent. This collection, a full dinner set and decorative pieces, is designed by the maestro of the floral arrangements by imagining this moments we share, when tables are being set where we will eat and drink, talk about the world or simply dream. By mixing shapes and colors of the Riviera landscape, Christian Tortu created a captivating collection, with a unique style, able to transcribe the sublime faces of this region. This promise of gentleness, fragrances and colors, ever changing as the hours of the day go by, has been translated to tableware with COSTA NOVA, who is always looking to expand its range of collections to keep on surprising the customers and stay ahead of the latest trends. There is a long list of compliments: legend, maestro, magician or star of haute bouture. Yet Christian Tortu insists, he is a modest flower designer. Nonetheless, he is best known for single-handedly challenging the way the world sees flowers. Christian Tortu mixes flowers, plants, vegetables and fruits in unexpected arrangements that strip away artifice and offer direct interpretations of nature. 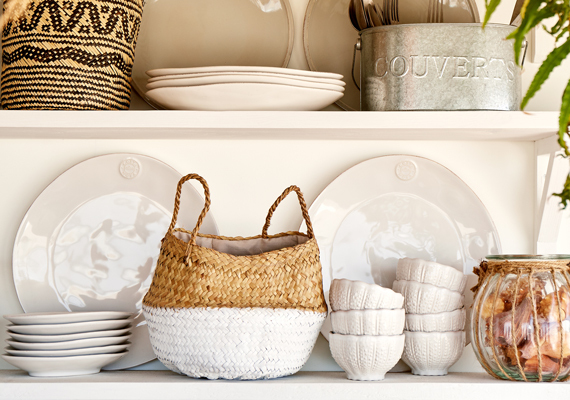 Drawing on the pure elements, his collection of vases, scented items, dishes or home accessories are designed to bring happiness and make everyday life a little sweeter and more beautiful. Today, his creations can be found in boutiques around the world and his floral scenography has been featured at famous events such as catwalks for Chanel, Dior and Valentino. Alternatively, he shows his talent at special events or during master and private classes around the world. 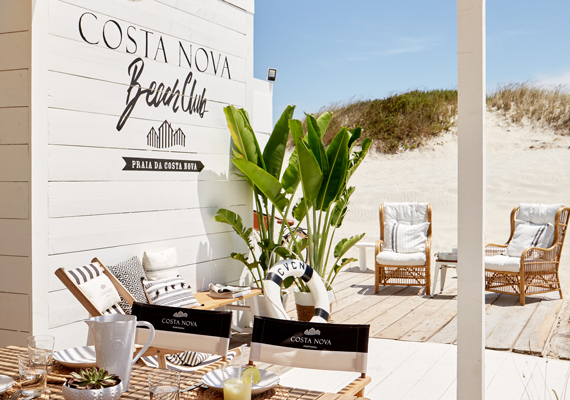 COSTA NOVA is a Portuguese brand dedicated to designing and manufacturing tableware and accessories made of fine stoneware from the best natural resources in Portugal. Since the beginning COSTA NOVA has been committed to the highest quality, service and design standards showcasing unique, timeless and simultaneously trendy collections that reflect the European heritage in ceramics and celebrate all that is irresistibly Mediterranean: the love of enjoying life, family, friends and good food. 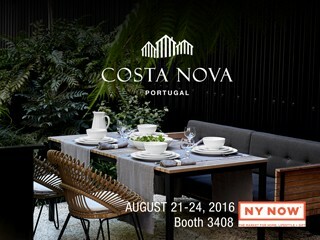 COSTA NOVA is exhibiting at the NY Now market for the first time. We will be presenting, for the first time at US Market, a tableware concept manufactured with the finest resources at our factories in Portugal. The visitors can enjoy the contemporary tradition lifesytle of the COSTA NOVA collections from 21th to 24th August at Javits Center, stand 3408. 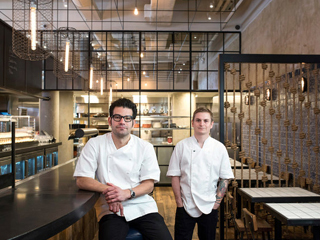 George Mendes awarded a Michelin star for his "Aldea" restaurant, in New York. Has just opened a new restaurant called "Lupulo" based in Chelsea, New York, inspired on Portuguese beer bars. Lupulo is decorated like a Portuguese "cervejaria" (beer bar) in Lisbon, with handcrafted white and blue tiles ("azulejos") and rustic wood accents. The menu is influenced by the classic Portuguese fare of seafood and wood-fire cooked meats, served on Costa Nova plates.